You can get all your required classroom textbooks and lab materials at the UC Blue Ash campus store, as well as a complete line of school supplies, course matierals, beverages and snacks. We're also your stop for UC fan gear and university gift items for friends and family. First, head to the Follet careers webpage. Click "Temporary Retail Team Member"
Tuesday 7:30 a.m. - 8:00 p.m.
Wednesday 7:30 a.m. - 8:00 p.m.
Friday 7:30 a.m. - 4:00 p.m.
All book returns require your original receipt. If you bought your books in the store, this will be a long traditional looking receipt; if you bought your books online, this will be several 8.5" by 11" sheets of paper. Both purchased and rented books may be returned. Books must be in resaleable condition. In the case of new books, this means no marks or writing of any kind. Access codes must not be opened and/or scratched off. We recommend that you attend class before opening books (particularly shrink-wrapped packages) so that if you have the wrong book or drop the class you will be able to get a refund. At the beginning of the semester, books meeting the above criteria can be returned for the first 7 days of classes. At most other times, books can only be returned for 2 days from the date of purchase. Books purchased during finals week do not qualify for refunds. Many titles in the Bookstore can be rented for the semester. Rental fees are typically much less than purchase prices, but rental books must be returned to the store by the date listed on your receipt. You must be at least 18 to rent, though you may have someone else rent for you. You must also have a valid credit card (or debit card with a Visa or Mastercard logo) to set up as collateral. Rental books will be counted as used when they are returned, so if you want to write or highlight in them, feel free! Just be sure to avoid water damage, torn out pages, and broken bindings. These may result in your having to purchase your book instead of returning it. If you decide you wish to keep your rental book (whether because it was really great, you found out you need it again next semester, or because it's gotten lost at home somewhere), you have the option to buy it out. Come into the Bookstore no later than the due date and pay the difference between the rental fee and the price you would have paid had you bought it originally. Be sure to return your books by the due date on your receipt! Books not properly returned will have nonreturn fees charged to the credit card left as collateral. The Bookstore can also buy back any purchased books that you no longer need. All Buybacks require your Bearcat Card. Books are bought back based on our needs. Books that will be used the following semester are typically worth the most (generally 50% of the purchase price). Books that are needed by other campuses may be sent to our wholesaler (typically pays 10-33% of purchase price). Books that are going into a new edition, are heavily damaged, or in loose leaf format may not be able to be sold back. We buy back books every day, but the best prices are typically in the last two weeks of the semester or during exam week. 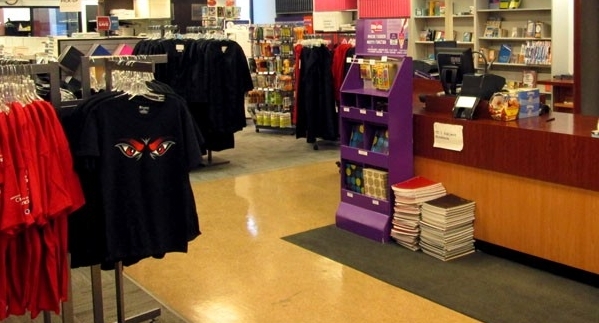 Check out the UC Blue Ash College Bookstore's online store.